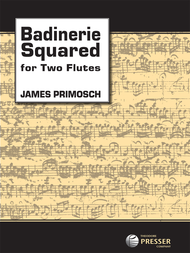 I just got word that Mimi Stillman and Bart Feller will give the New York City premiere of my Badinerie Squared, the little take-off on the Bach B-minor Suite movement that I wrote for Mimi and Jeffrey Khaner. It’s on a program of the New York Flute Club, to be held at 5:30 pm on October 18th at Engelman Recital Hall in the Baruch Performing Arts Center, 55 Lexington Avenue (entrance on East 25th Street). More info here. You can read about the piece here, and order a copy here.